Daniel Brewer goes to work each day knowing he’s helping to support the safety and health of colleagues at Meyer Najem Construction. “My motivation for working is to help make a difference for my company and those who are affected by our work,” says Daniel. 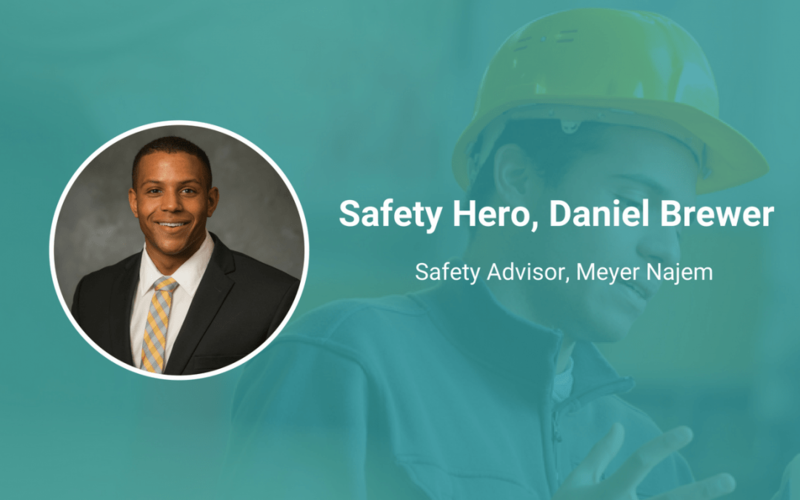 Let’s take a closer look at how Daniel ended up in his current role, and what his advice is for others who may be starting a career in safety. I explored a few potential career paths at IU. I started off wanting to go into Physical Therapy, but then switched to Healthcare Management. In order to get management experience, I interned as a Production Supervisor at a Chrysler Transmission Plant, where I also worked with the safety team at the plant. I enjoyed working on safety related items as an intern supervisor, so the following summer I worked at the Transmission Plant as a Safety Intern. The next summer I began my journey with Meyer Najem as a Safety Intern and now continue to work for MNC as a Safety Advisor. Having a strong understanding of your field. I am constantly asking our superintendents about the work happening onsite. Once you gain a better understanding of the work of those you are trying to keep safe, you can anticipate when hazards might occur and plan accordingly. Also, don’t get stuck pounding the keys. You won’t be able to effectively identify hazards if you’re sitting at a desk all day. Get to know the guys and girls you are working with. I think this goes with almost any field. It is especially important in safety because several people have a negative view towards safety. As a safety professional, you don’t want the only time you’re talking to other employees to be because of safety deficiencies. Operations should not feel attacked by safety, but rather assisted. My main goal as a safety professional is to make a difference with my work. I don’t want to go to work every day feeling as if nothing would be different if I weren’t doing my job. So my motivation for working is to help make a difference for my company and those who are affected by our work. I’ve had companies reach out to me about job openings in safety who I would have never thought they would have full-time safety employees. With companies seeing the need and benefits for safety staff, I believe the field is going to continue to grow. Superman has limitless speed and strength. Spiderman scales walls. These heroes undoubtedly keep cities safe, but they happen to be fiction. In the real world, there are very real heroes walking among us – often going unrecognized. These are our Safety Heroes. If you know someone who should be nominated, let us know today.